Type GF Grease Filters - Airsan Corp.
For lower velocity or medium-duty applications of grease and flame control, Airsan Type GF air and grease filters are an ideal cost-effective alternative to a heavy-duty Type AG grease filter. 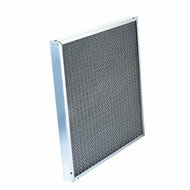 With the same 18-gauge galvanized steel frame, this filter’s 5-piece media creates an air flow pattern that allows efficient air passage while capturing airborne dirt, grease and lint particles while extending the useful life of coil, blowers, motors and other mechanical equipment. FOR LOWER VELOCITY OR MEDIUM DUTY APPLICATIONS OF GREASE AND FLAME CONTROL, AIRSAN TYPE GF AIR & GREASE FILTERS ARE THE IDEAL COST EFFECTIVE ALTERNATIVE TO THE HEAVY DUTY TYPE AG. UTILIZING THE SAME 18-GAUGE GALVANIZED STEEL FRAME, THE GF FILTER’S 5-PIECE MEDIA CREATES AN AIR FLOW PATTERN THAT ALLOWS EFFICIENT AIR PASSAGE WHILE CAPTURING AIRBORNE DIRT, GREASE AND LINT PARTICLES WHILE EXTENDING THE USEFUL LIFE OF COIL, BLOWERS, MOTORS AND OTHER MECHANICAL EQUIPMENT.